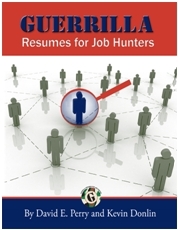 Guerrilla Job Hunting - Q: How can you tell a sincere job posting from a fluffed up job posting? Q: How can you tell a sincere job posting from a fluffed up job posting? A: It’s more than 25 words long. A sincere ad will as much try to screen people out as in. For example minimum requirements often means exactly that. If you don’t know the difference between thermal underwear and a thermal coupler – you shouldn’t apply – chances are your transferable skills won’t be enough. Sometimes it really is rocket science.